Phil Matthews grabbed an injury time winner to ensure Flitwick Town were crowned Bedfordshire League champions on Saturday. They claimed a 2-1 win at Marston Shelton Rovers, their other goal coming from Josh Reynolds, to secure the Premier Division supported by Sportsform title. The chase for the runners up spot now seeing AFC Kempston Town & Bedford College back into second spot following their 3-2 home win over Ampthill Town Reserves. Delroy Phillips, Courtny Boughton and Mike Stephenson netting the all important goals. The non-playing Wilstead taking up third spot just a point adrift of the Town but goal difference ahead of Caldecote whose eight game unbeaten home run was brought to an end when beaten 4-2 by Cranfield United. David Adderson with a brace plus Martin Holland and Sam Evans marked the United scoresheet against home replies via Jack Boyd and Nicky Albone. Whilst in fifth spot just a point adrift of Caldecote are last seasons champions AFC Oakley M&DH who took their unbeaten away ways up to 10 games with a 2-0 win at bottom of the table Sandy thanks to goals from Michael Cox and Jack Weeden. Caldecote take on Marston Shelton Rovers in the Britannia Cup final at Kempston Rovers on Monday, May 1 at 6.30pm. Ickwell & Old Warden claimed their first win in 10 outings with a 4-2 home victory over Sharnbrook. Lea Threadgold with a hat-trick was supported by a single strike from Conor Green. Elsewhere, Wootton Blue Cross are now unbeaten in their last seven home starts after beating Renhold United 4-0. Robert O’Dell with a brace joined on the scoresheet by Chris Butler and Patrick Downes. 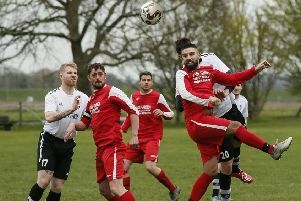 Queens Park Crescents face Totternhoe Reserves in the Centenary Cup final at Cranfield United FC on Friday, April 28 after claiming a 3-2 home win over Shefford Town & Campton Reserves. Daniel Rasol fired them ahead before Town strikes from Ryan Dobson and Simon Castle took Shefford into a 2-1 lead. But back came the Crescents to claim their final spot with goals from Fabio Sattar to make it 2-2 before Shazed Sattar headed home in the 90th minute. The lone action saw AFC Kempston Town & Bedford College Reserves have their six games winning away run brought to an end and with it their chance of a top three finish when beaten 3-0 at Old Bradwell United Reserves. Aaron Murray from the penalty spot plus goals from Charlie Wells and Dre Neil did the damage. The fight for the Division Two crown is still very much in the melting pot. Current leaders Wixams stretched their unbeaten run to 10 games with a 6-0 victory at AFC Oakley M&DH Reserves where Gareth White claimed a hat-trick. However, second place Riseley Sports are just five points adrift with two games in hand after a 3-2 home victory over Sundon Park Rovers. Renhold United Reserves were crowned Division Three champions without kicking a ball when the only team that could have caught them, Wilstead Reserves, could only draw 1-1 by White Eagles. Joe Sullivan on the home scoresheet against an Eagles reply from Arkaduisz Boruch. Second place Bedford Albion were also held to a draw, 0-0 at Sandy Albion. The biggest win of the day saw Kempston Athletic thrash Caldecote A 8-2, Caldecote goals from Gary Allum and Tony Norman. Shefford Town & Campton A were 1-0 home winners over Wootton Village. Sam King netting the goal. Marston Shelton Rovers Reserves will play AFC Oakley M&DH Reserves in Saturday’s Watson Shield final at Shefford Sports Club Complex (kick off 2pm) after claiming a penalty shoot-out winner over Delapre Dragons Under 18s. Steven Wilson and Mathew Tatham scored for Sandy Reserves but they lost 3-2 at home to Harlington. The Biggleswade Knockout Cup Final sees AFC Kempston Town & Bedford College take on Shefford Town & Campton at Langford’s Forde Park on Friday, May 5.